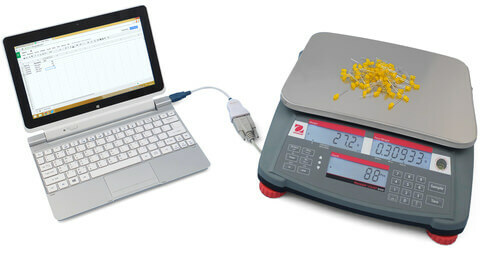 Many of our weighing instruments customers were looking for a simple, affordable solution to transfer the weight shown on their scale into an application running on their computer. This prompted us to develop 232key, which is today being used around the world in connection with a large variety of serial devices (not just weighing scales). 232key runs in the background and waits for the connected device to send data over a COM port (RS-232 or virtual serial port). The data is then captured, formatted and typed into the application running in the foreground as simulated keystrokes. This ensures that 232key can be used with any application which accepts keyboard inputs. Pre-defined profiles for many popular scales and balances. Automatic detection of decimal separator. Auto-saving and loading of settings. You can download the program for free on its website 232key.com. A paid version with additional features is also available. Thanks to feedback from our customers, we’re regularly releasing new versions, you can read all about it in our blog. Simple Data Logger is an easy to use PC-based data logging application. It connects to devices like measuring instruments (e.g. scales and balances) or barcode scanners and writes the received data to a CSV file, optionally adding the date and time. Files written by SDL can be easily opened in Excel, Open Office Calc or similar spreadsheet applications. SDL currently supports the following connections: RS-232, USB (virtual COM port), Bluetooth SPP and TCP/IP (TCP client). Simple Data Logger is free for personal, non-commercial use. A paid license is required for all other purposes or to use the ‘Plus’ features. For further information, please visit our Simple Data Logger website. TCPTester acts as a TCP client, connects to a TCP server, sends a command and waits for the reply. Once the reply has been received, the command is repeated. If the server does not reply within a user-defined timeout, an error is logged. TCPTester was developed to test scales and balances which are either equipped with an Ethernet interface or connected to a serial device server like the Moxa NPort series. An early release of TCPTester is already available.